Demonstration of gilets jaunes (yellow vests) in Belfort, France, on Dec. 29 2018. Photo: Wikipedia. The Yellow Vests protests that began last November in Paris to oppose the Macron government’s increase in the gasoline tax have been hailed by some on the left as a successor to the strikes of 10 million French workers and students in 1968. However, the anti-immigrant, anti-Semitic elements that have emerged from within make me doubt that. Even apart from white supremacist groups as far away as Ireland and New Zealand claiming the Yellow Vest to symbolize their own fascist demonstrations, one could make comparisons to the 1970 New York City Hard Hat Riot of construction workers mobilized to support Nixon by attacking marchers against the Vietnam War and the invasion of Cambodia. The Yellow Vests may have more kinship with the 2009 Tea Party rallies orchestrated against Obama than the massive women’s marches against Trump’s seizure of power or the ongoing demonstrations in Hungary against Orban’s “slavery” labor law. It has been a shocking and saddening experience to know so many of my neighbors voted for Bolsonaro. When I questioned them, they said it was because there is too much crime everywhere, and because the Workers Party was mired in corruption. When I try to point out that a greater number of politicians from the other major parties have been indicted, or that more police won’t make the streets safer, the people answer that it is fake news. They want to believe that Bolsonaro is the answer to all their problems. I expect that their problems are not going away soon. I know that evidence of U.S. interference in Brazil has been available from time to time, but people believe what they want to believe. A Jan. 3 article in the San Francisco Weekly by Joe Kukura reveals that Uber accepted major start-up money from the Saudi Public Investment Fund (PIF) chaired by Prince Mohammad bin Salman, who is suspected in the Khashoggi killing. Lyft, WeWork, DoorDash, Slack, and others later received large amounts from the PIF. Elon Musk came close to offering a controlling interest in Tesla to the same fund until the Securities and Exchange Commission put a stop to it. In the heady world of start-up capital, this kind of money can become an intervention into American life every bit as bad as Russian interference in the political process. This may become a subject of greater public attention in the months ahead. missing from other news stories. It doesn’t shy away from the fact that it is U.S. imperialism, brutal Central American governments, and the poverty capitalism necessitates that create the conditions for the immigrant caravan. But what’s most important, I think, is that it shows it’s not just about those seeking asylum, which is the liberal’s main argument for supporting it. It’s about people taking matters into their own hands, trying to make a better life, borders be damned. When liberal people in the U.S. talk about the U.S. as a country of immigrants, I think they are expressing the same kind of sentiment even if they’d reject the logical conclusion—the world is my country, or in the words of a homeless person I worked with years ago, “the earth is my home. I have a hundred apartments.” Borders be damned. The corporate backers of charter schools hoped that teachers would quietly endure low pay and poor working conditions and not advocate for their students and communities. 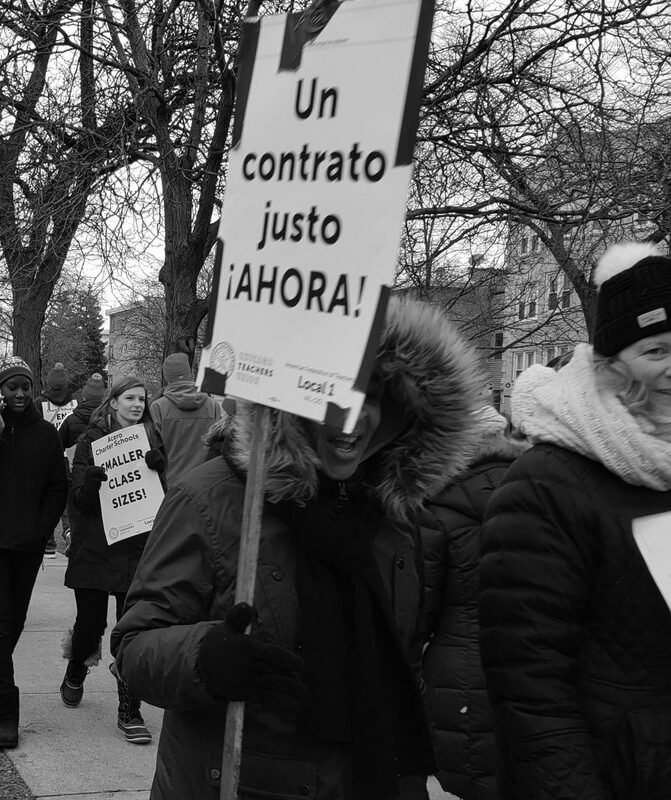 Hopefully charter teachers around the nation will also organize for education justice using the Chicago strike for inspiration and guidance. By shutting down the government Trump is not only holding federal workers hostage for his racist wall; he’s destroying their lives and others’ too. It is unconscionable. But then our loser “President” has no conscience. He’s creating a disaster. One can only hope it destroys him. In the wake of the week-long pageantry over the death and funeral of former president George H.W. Bush, Trump’s appointment of William Barr as attorney general once again confirms the opportunistic, manipulative, deceptive, dishonest and politically motivated nature of all his decisions, in addition to his obsessive preoccupation with the Mueller probe. Barr is just Whitaker with a different face. Both were publicly critical of the Mueller probe. The only difference is that Barr has the imprimatur of the late president that the country is mourning for right now. This was a political opportunity that Trump could not resist capitalizing on that exposes his true character, or lack of it. His desperation is such that he will do anything to derail Mueller. The Democratic Presidential Primary is turning into a comedy of errors, but one that isn’t funny. It underscores the tragedy of the 2016 Election. Tulsi Gabbard is friendly to Syria’s President, Bashar al-Assad, which reveals one of the major weaknesses of Bernie Sanders’ candidacy. John Delaney is more Ego than Erudition, and preaches “bipartisanship” with no sense of what is objectively right or wrong. Julián Castro, all ambition, talks about “new blood” but his ideas are so old that the wheels are falling off. One thing does seem clear: had Hillary Clinton been elected, despite all of her shortcomings, many lives might have been saved in Syria and elsewhere. Let’s hope things improve in the near future. When the Striking to Survive authors were here (see “‘Striking to Survive’ in China,” Nov.-Dec. 2018 N&L), they reported that most of the workers participating in this third major wave of strikes in the Pearl River Delta were women. One comment was that only when striking against their bosses women workers said they “felt human.” I asked them to comment on it some more, noting that demanding recognition of one’s humanity is the content of every movement, like #MeToo in the U.S. One author responded that as the economic reforms came to China, the owners/managers/foremen of the factories treated women employed there as their personal harems. He continued that it was an issue raised in the first wave of strikes and that kind of overt sexual exploitation is no longer accepted and thus feminism is not a primary concern. While sexism persists, it is not the only problem women workers face, he said. Afterward, one of the Chinese students who came to the talk told me about the new persistent #MeToo movement in China. 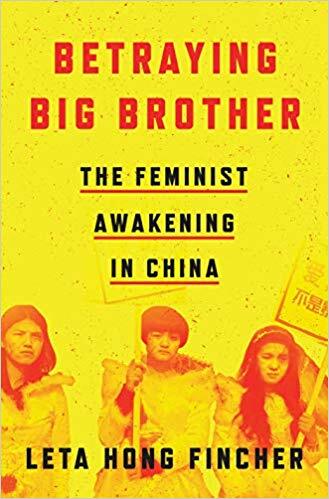 See “Review: Feminist Awakening in China” in the same issue. I understand that the anti-Semitism of some of the leaders of the Women’s March in Washington was made public by right-wing wanna be fascists. That’s bad. But as bad as it is, it doesn’t mean that those refusing to condemn Louis Farrakhan should get a free pass. They need to ask themselves, “What is best for the movement for women’s liberation?” If they answer that question honestly, they will step down. Why are people talking about Farrakhan as if the only objection to cozying up to him is his unabashed anti-Semitism? What about the fact that he is also anti-revolution, anti-women, anti-Gay, and, yes, anti-Black? He wrote that Malcolm X was “worthy of death” shortly before his assassination and repeated the message years later. He traveled to Africa to hobnob with dictators who suppressed Black African dissidents, such as General Abacha of Nigeria who had Ken Saro-Wiwa executed. His “Million Man March” was explicitly sexist and for “atonement” instead of radical change. Supporting this is a total betrayal of what the women’s marches were all about. To add to the recent news on the national prison strike: South Carolina was a part of it along with about 17 states. Since the Christmas holiday we’ve been allowed no visits. It’s funny how sometime you are put through persecution for trying to better yourself while incarcerated. You’d think you would be rewarded or, at the very least, praised for having the intention to change your life for the better. But all too often the “justice system” seems to stop at nothing to hinder your endeavors at a new way of life. Here at the Meherrin River Regional Jail—an all for-profit facility—the administrative staff has made a business decision that goes against the legal requirements for a religious diet. They are forcing me into a hunger strike until the proper demands are met. I’m learning that a hunger strike is difficult at times when no one is willing to stand with you and fight for what is rightfully ours. But I will not stand down. Any words of encouragement will be greatly appreciated. Please continue my subscription—donor-contributed. I enjoy reading N&L and appreciate the consistent support and solidarity it extends to those of us under the racist, repressive boot heel of Amerikkka’s gulags of mass incarceration all for corporate super-profits, having nothing to do with “public safety” and everything to do with the business of the carceral state. That business is to imprison a segment of the population it has always considered as “surplus populations”—from its schools to the prison pipeline and to chaining us all to its fascist U.S. prison industrial complex. More humiliating and repressive is the known fact that the great majority of us in Amerikkka’s houses of pain and torture are people of color. This continues the “tradition” of Amerikkka’s so-called “founding fathers” from cotton plantation slavery of African Americans, to the genocide of Indigenous Nations and the theft of our homeland where we are, as the fascist fuhrer pig-in-chief Donald Trump calls us: “criminals, wetbacks, illegal aliens, drug dealers, gang members” and, recently, “animals.” This is all “legalized” by their favorite weapon of tyranny: “Law!” and capitalist politics! 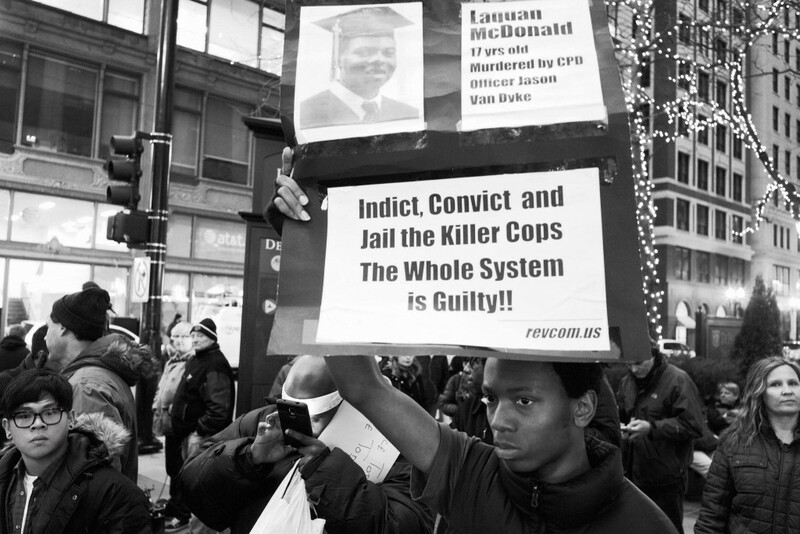 Participant in “Justice for Laquan” rally and march in Downtown Chicago on Oct. 25, 2015. Photo credit to Frank James Johnson. Four years ago, Laquan Mcdonald, an African-American 17-year-old, was murdered by Chicago cop Jason Van Dyke, who fired 16 shots at Laquan, even after he was dying motionless on the ground. Despite the police lying to protect Van Dyke, he was still convicted of murder, but only three cops were indicted for the coverup. Now a judge acquitted them, even though it is obvious that they lied, falsely claiming that he lunged at Van Dyke with a knife. The code of silence is wider than the cops and includes the judges, prosecutors and politicians like the mayor. It goes to show that the whole racist, lying system is the enemy of Blacks just for being Black but also it is the enemy of anyone who seriously tries to change things. Finally, Van Dyke was sentenced to less than seven years for murder. We welcome your contributions to N&L and for our website. There are some things we cannot provide. We do not match up pen pals. N&L cannot help prisoners with individual legal cases, and we cannot offer legal advice or access to attorneys. 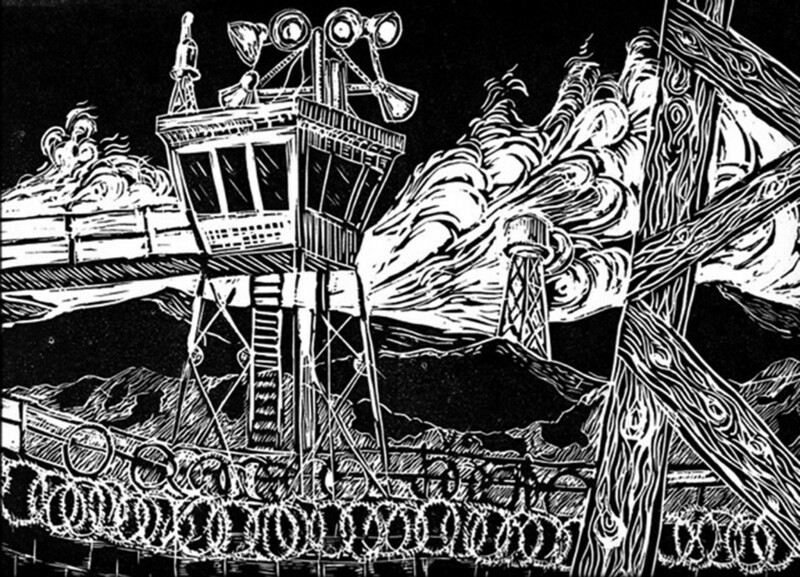 This paper is a place where the voices of people engaged in struggles inside and outside prison walls can be heard speaking for themselves. This entry was posted in Articles and tagged #MeToo, African-American history, anti-Gay, anti-immigrant, anti-Semitism, Barack Obama, Bashar al-Assad, Bernie Sanders, Betraying Big Brother: The Feminist Awakening in China, border wall, Brazil, capitalism, charter schools, Chinese workers, criminal injustice system, Curtis, D. Cheneville, Donald Trump, Elon Musk, France 1968, French President Emmanuel Macron, George H.W. 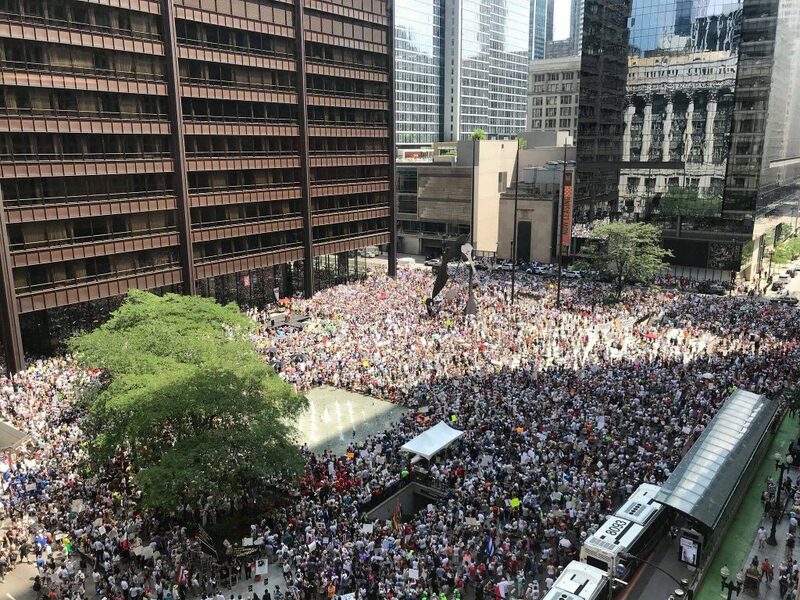 Bush, Hillary Clinton, Hunger strike, immigrants, J.C. McFadden, Jair Bolsonaro, Jamal Khashoggi, Jason Van Dyke, Joe Kukura, John Delaney, Julián Castro, Ken Saro-Wiwa, Laquan McDonald, Louis Farrakhan, Lyft, Maggie Soleil, Malcolm X, Meherrin River Regional Jail, Mohammad bin Salman, Namo Amigabha, Pearl River Delta, Prime Minister Viktor Orban, prison strikes, Prisoner, racist, Richard Nixon, Robert Mueller, Striking to Survive: Workers’ Resistance to Factory Relocations in China., Susan Van Gelder, Tea Party protests, Tulsi Gabbard, U.S. imperialism, Urber, Urszula Wislanka, white supremacy, William Barr, women's liberation movement, Women's Marches, Yellow Vests. Bookmark the permalink.